The steamboat Daily operated in the early 1900s as part of the Puget Sound Mosquito Fleet. In later years, Daily was renamed Island Princess and later Cy Peck. Daily was built in 1913 by Matthew McDowell at his yard at Caledonia, near Tacoma. Daily was one of the larger vessels built by Captain McDowell, 116' long, 25' on the beam, 8' depth of hold and rated at 254 tons.Daily was the seventh Puget Sound passenger and freight vessel built by Captain McDowell. Daily was a classic example of a mixed-used Puget Sound mosquito fleet vessel, as shown by photos published and drawings prepared by Professor Turner. Daily was placed on the Seattle-Tacoma route, running via points on Vashon and Maury islands. 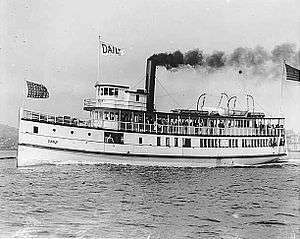 In 1918, Daily was sold to the coastal service of the Canadian Pacific Railway, who renamed her Island Princess. CPR put her in the Gulf Islands service, where she made a significant improvement. She was the smallest vessel in the CPR Fleet.Island Princess (ex Daily) ran for CPR from 1918 to 1930. She served points on North Pender, South Pender, Mayne, Galiano, and Saltspring Islands.